With a lack of spaces in the Bay Area for underrepresented artists, Nook Gallery works to carve out an inclusive and accessible space to support and gift room for artists of color, women and queer artists, to present and show new work. The seated kitchen nook-turned-gallery gives artists a unique space to work with, and present work within. With conversation and critical dialogue at the center of Nook Gallery, the physical form of the space asks what does it mean to gather around a table, to come together for a meal or to cook together - for art, for critical discussion, for storytelling? Nook Gallery has been a valuable project for Lukaza Branfman-Verissimo and the community, but it has been running entirely on a volunteer basis, both by the artists and the curator. FUND the NOOK will enable Nook Gallery to modestly fund exhibitions and an artist talk series. Specifically, It will support a curator, artists, rent, gallery maintenance and equipment, and public outreach. Over the next year and a half, Nook Gallery will support, produce and curate 8-10 exhibitions and 2 talk series, working exclusively with artists of color, women and queer artists. With conversation and critical dialogue at the center of Nook Gallery, both physically and philosophically, we want the exhibitions and programming to pose questions to the Bay Area community and beyond. The exhibitions will be a mix of group and solo shows, presenting and highlighting the work of local artists. Each show will be up for 1-2 months at a time, with an opening reception, public event and closing reception. There will also be an option for the production of printed matter prior or post show. The talk series will happen separately from the exhibitions, but will still examine similar topics and ideas. Rather than focusing on the display of visual art, the talk series will give performers, filmmakers, visual/critical thinkers and writers, an opportunity to share their work. Lukaza Branfman-Verissimo is the main curator of both the exhibitions and talk series, but she plans to invite two guest curators to program shows. Indira Allegra, Lukaza Branfman-Verissimo, Mitsuko Brooks, Marisa Burman, Tania Butterworth, Ethan Caflisch, Sydney Cohen, Amanda Curreri, Ricki Dwyer, Shannon Finnegan, PJ Gubatina Policarpio, Angela Hennessy, Jay Katelansky, Jaime Knight, Bruna Massadas, Rosa Novak, Zach Ozma, Emilia Shaffer-Del Valle, Emily Tareila, Taylor Zarkades King, Catalpa Residency, Wolfman Editions, Night Diver Press & More! THANKS FOR YOUR SUPPORT- THIS WOULDN'T BE POSSIBLE WITHOUT YOU! 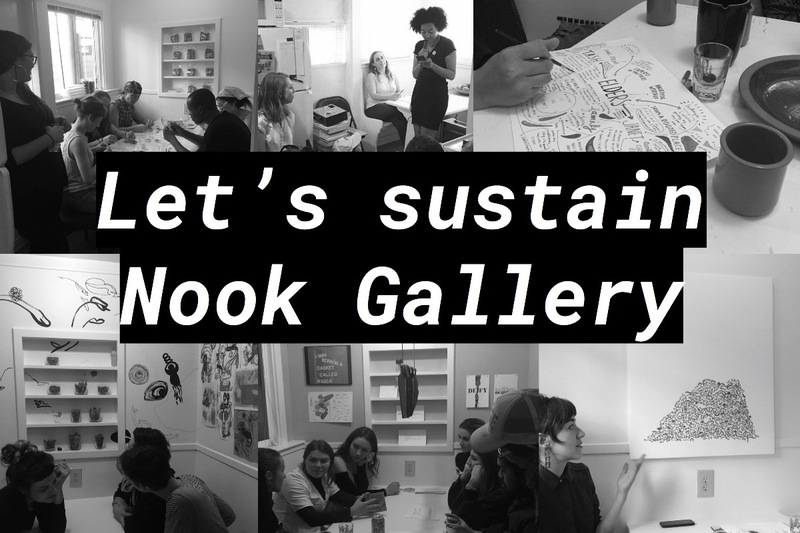 Thank you, thank you, thank you to everyone who has donated to help keep Nook Gallery up and running, we are 50% funded!! Plus we have a handful of incredible works of art available on our online store, if you would like to donate through there!